What’s In your Yorba Linda Garage? Get Rid of the Clutter! Just because you have large garage doesn’t mean you always have to park a car in there. Technically, this is a viable space that is part of your home that can be repurposed into many different functions. Putting down linoleum flooring and putting up some drywall can convert your garage into a great play area for the kids. If the garage is situated in the back of your house, you could remove the rolling door and replace it with French doors. Now you have a space that can be used as guest room or home gym. Of course, there is nothing wrong with setting up your garage as a “quiet zone” that lets you relax with in a comfy chair or stretching out doing yoga. 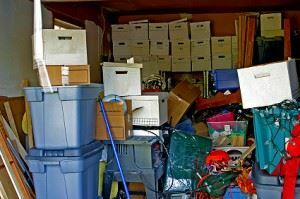 However, before any of that can happen you first need to get rid of the clutter. That is where Junk King is going to be a huge help. You might have noticed the red Junk King truck making the rounds in your area. That means that your neighbors have already discovered the benefits of hiring this professional junk hauling service. Junk King will provide you with a two-man moving crew who will be equipped to lift, haul and/or dismantle anything you want to get rid of. For those extreme jobs where there is an exceptional amount of clutter, Junk King can dispatch additional crewmembers and trucks. The goal is to help you get rid of the clutter in a single appointment. After they’re done in the garage, the Junk King crew can then take a pass at the rest of your house. Just point to all the things you want removed and the Junk King crew will handle the rest. In fact, they will be upset if you lift anything! Take note that Junk King is a totally green kind of company. They will automatically recycle or donate the majority of what they collect from your home. This is another part of their training, to recognize all those items that can be repurposed. When it comes to pricing, you’ll find that Junk King is a great deal. You’ll be paying a single fee based on how much space your junk will take up on the back of the truck. It’s probably the best deal in Yorba Linda for this kind of work. Get rid of the clutter with one call to Junk King. This entry was posted in What's In your Yorba Linda Garage? Get Rid of the Clutter! and tagged Get Rid of the Clutter, Junk King, junk removal on November 27, 2014 by Junk King. Last updated July 31, 2017 .